Near to the town of Habarana is a very remote community named Veheragala which belongs to the Palugaswewe Divisional Secretariat of Anuradhapura District. The main income source of the villagers is rice cultivation and there are some 280 families who have severe poverty from low success with agriculture due to droughts which last many months of the year. Thus the economic background of the village is in a very poor state. The provision of a water well is vital for transforming the quality of life here. The same sad state is true of the educational standards of the village. Female children usually marry without completing school as they have little appropriate guidance and encouragement for education. Few children are motivated to pursue education beyond GCSE ‘O’ Level standard. The Chief Incumbent of the temple of the village is the Rev. 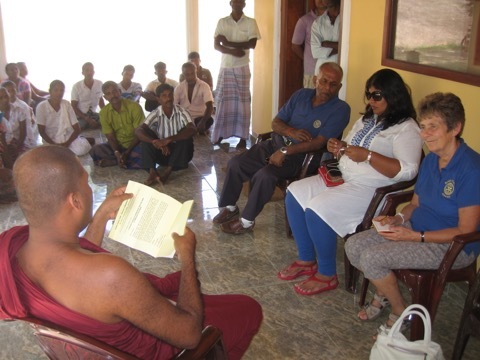 Maharambawawe Palitha and his vision is to create a village library and classroom where he and other volunteer teachers might encourage children to learn and to appreciate the importance of higher education. In 2016 Project Sri Lanka Trustees agreed to provide a deep water well for use by the village people. They also committed funds so that the Chief Incumbent could organise the purchase of books and furniture to start the educational facility in the community.